He did this afternoon. Witnessed by Rick Gurski and Joe Teater. Thanks Eric, you helped us a lot today. Including that what to do with extra fives at WW. do you mean extra $5 bills? 4 aces in one week, two at old pike, one at WW and one at Rosie. Awesome!! I meant $5 bills. You will just have to keep your double boogies. 8/27/2013 @ Swope League, Jared Finley hit an Ace on hole #2 with a full weight Destroyer. It was witnessed by me (Van) and TJ Ring...as well as others who were playing league. He did not pay into the Ace Fund, so he did not win the pot, but was given $5.00 by one player on his card. I FINALLY hit my first KC Ace. Hole 7 at Jack Lowes house, in the dark! spammer, you need to be paid and have a signed disc to post an ace on this thread. Blue Valley of Kansas hole #10. 210ft with a FLX Avenger SS. $146 payout. The line was good but it was like eight feet too high. Hit an apple laden hedge branch and shot straight down into basket. No chains. Hit an apple laden hedge branch and shot straight down into basket. No chains. Fun to watch! Couldn't of happened to a nicer guy. First Friday Traveling League ACE ever . . .
Hole 15 Legacy , hit ACE #2 for the year. 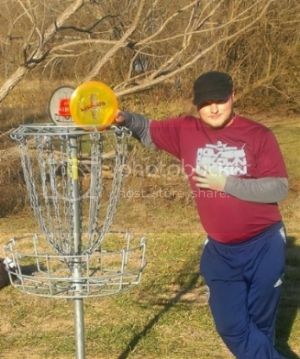 I hit my 4th Ace today on hole #5 @ Blue Valley, KS with an X-out lucid truth. Witnessed by Mike Petrin after I talked him into taking a break from packing up his house. That hole was my first and only ace. Maybe someday I will get a second ace. If that is not the case, then I will just erase and go back to getting some fourth base. First Ace at Birdland! Hit hole 9 yesterday with a renegade. haha. I see the rest of that story wasn't included.